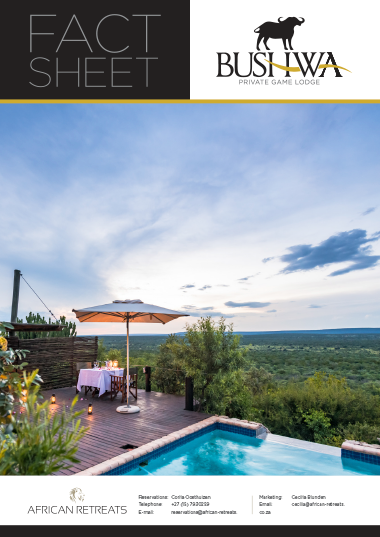 Bushwa Private Game Lodge is a luxury hideaway in the lesser-known, malaria-free Waterberg region just outside of Johannesburg. The camp has a main area offering luxury tents and chalets, a romantic treehouse overlooking a waterhole and then the self-catering bush camp. When you're not bumbling around on a game drive there's the option to indulge in a choice of spa treatments at the Tsamma Bush Spa. Life at the main lodge is bliss. Relax at the rim-flow swimming that has breathtaking views of the wilderness, enjoy evenings under the stars in the boma area or relax in one of the many lounges. The self-catering camp also has its own swimming pool and facilities, making it ideal for groups. The treehouse is perfect for a spot of romance, and comes highly recommended for honeymooners. 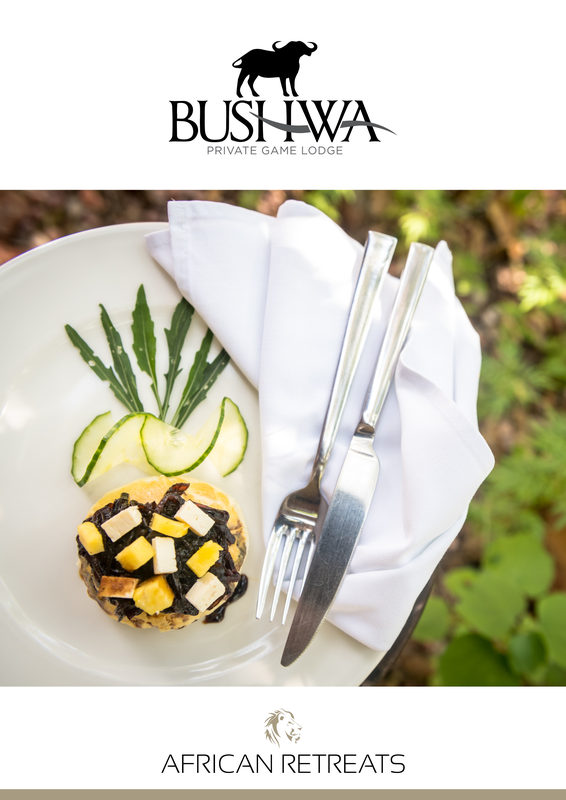 Food is a highlight at Bushwa, and there's plenty of homegrown fare on offer - vegetables are produce are grown on the property. Bushwa is the ultimate in safari bliss. 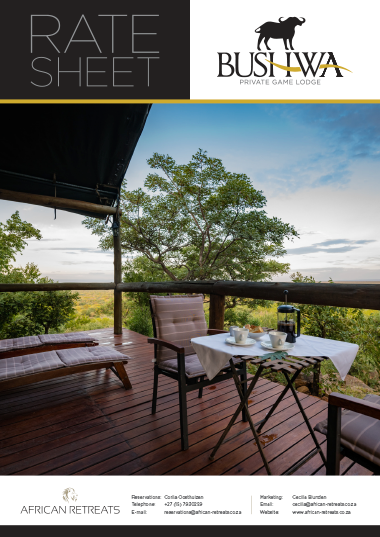 4 luxury tents/chalets (sleeps 8 in total), a spa room, romantic treehouse overlooking a waterhole sleeping 2, and a self-catering bush camp sleeping up to 20. Each of the luxury tents/chalets have private viewing decks with deck chairs, en suite bathrooms with outdoor showers, mini-bar and four poster beds. Mosquito nets, plug points and pedestal fans in each room. Waterhole, boma with campfire, swimming pool, bar area and lounge space in main lodge. Spa treatment room and facilities (Tsamma Bush Spa). Fully stocked bar and wine selection. Waterhole in front of main lodge. Daily morning and evening game drives with qualified guides. Guests can also opt to enjoy clay pigeon shooting, target shooting, star gazing and bird watching. 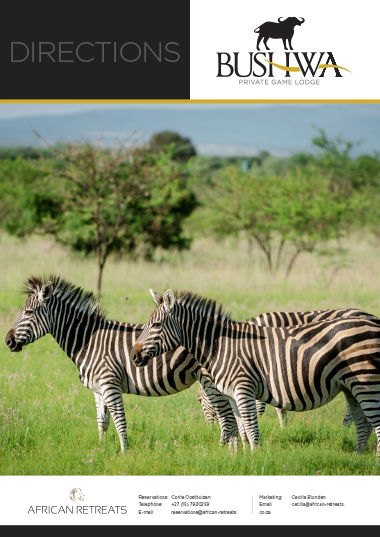 Located in the midst of the Waterberg mountain range and surrounded by the serene Vaalwater area, Bushwa Private Game Lodge is most certainly well-placed. The Waterberg region is roughly 250 km outside of Johannesburg, which makes it an ideal destination for a quick weekend break from the bustle of the city. The Waterberg is a malaria-free zone. The rugged beauty, diverse biome covering conservation areas of more than 150, 000 hectares makes this region an unusual region worth exploring. Bushwa is an easy self-drive journey, with the closest town being Vaalwater and the closest major international airport being O.R Tambo. There are Toll gates en route, so do be aware that you will need to pay road tolls. We estimate the drive to be between 2 - 3 hours, dependent on traffic. Follow the R21 from O.R Tambo towards Pretoria, the R21 becomes the N1. Follow the N1 through Pretoria until you reach a toll gate (Kranskop) where you will take the Modimolle/Nylstroom turn-off. Head towards Vaalwater, turn right at the SPAR shop onto the R33 Ellisras/Lepalale Road. After 10km turn right at the Zanddrift dirt road for 5km. Turn left at Bushwa Game lodge sign.